Amazing Optimus Prime from the 2017 Transformers The Last Knight movie! Action figure stands 19-inches tall and boasts 99 points of articulation! Features illuminated eyes, an interchangeable battle mask, a blaster shield, a Cybertronian sword, and a detachable wrist blade! Hasbro and ThreeA team up to create an amazing Optimus Prime from the 2017 Transformers The Last Knight movie. 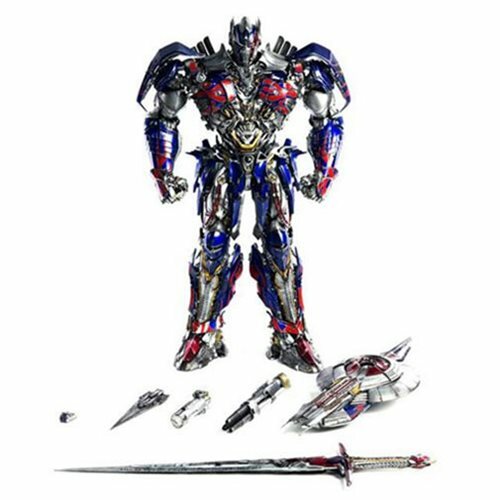 This remarkable Transformers: The Last Knight Optimus Prime Premium 1:6 Scale Action Figure stands approximately 19-inches tall and boasts an impressive 99 points of articulation. Optimus Prime also has LED illuminated eyes and runs on 2x "AG-13" batteries (not included), plus an interchangeable battle mask, blaster shield, Cybertronian sword, and detachable wrist blade! Ages 14 and up.